After losing iconic goaltender Liz Knox following the 2010-11 women’s hockey season, head coach Rick Osborne sought out a replacement. He tried to find something that would work between the pipes, and through conditioning and intense discipline, he thought he found a system that would work with second-year goaltender Erika Thunder. However, following the 2012-13 season, Thunder let Osborne know that she would be leaving Wilfrid Laurier University to return home to Buffalo Point, Manitoba, leaving women’s hockey looking for that potential goaltender again. According to Osborne, Thunder came into training camp at the beginning of the year not in the best shape, and returned from the winter break not physically ready for the remainder of the season. With concerns, Osborne started looking to fix the goaltending woes. But when the women’s hockey team began their bootcamp in January, Osborne saw a positive response from Thunder and decided to continue with his current goaltending. “There were just some late developments after her exit interview that really flipped her and I wasn’t expecting that,” Osborne explained. However, despite Thunder’s surprising exit from WLU’s women’s hockey program, Osborne had already recruited a goaltender he saw immediate potential in. 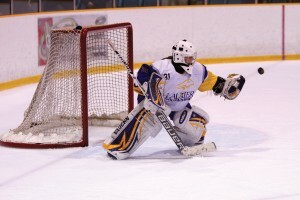 Amanda Smith, a 5’5” goaltender from the Etobicoke Dolphins of the Provincial Women’s Hockey League (PWHL) was one of Osborne’s main recruits. Smith started 20 of her team’s 22 games and had a 9-8-3 record, with a 2.19 goals against average and a .932 save percentage. Osborne believes that Smith will join current goaltender Kayla Brown between the pipes, and mentioned it could get competitive for the starting position. Despite the setbacks following the 2012-13 season, Osborne feels very confident in the depth of his team, as well as the goaltending situation he’s dealt with for the last three years. “I feel like we’re in probably the best shape we’ve been in in a few years with goaltending,” he said. Author: Shelby BlackleyShelby Blackley is the former Editor-in-Chief of The Cord. Shelby has an obsession with green tea, owns too many writing notebooks and finds solace in a nice cold brew.